The great musician Orpheus wins the chance to lead his wife Eurydice back to the land of the living. But on their journey he breaks his vow to the king of Hades. He looks back at Eurydice – and so loses her forever. The Orpheus myth has inspired artists for millennia, and they all have a different take. The five works by The Royal Opera this year ion the theme of Orpheus show the staggering diversity of artistic responses. Monteverdi’s Orfeo last February, Birtwistle’s The Corridor in the summer, and in the autumn Gluck’s Orphée et Eurydice on the main stage, Little Bulb Theatre’s Orpheus in the Linbury Studio Theatre and Rossi’s Orpheus in the Sam Wanamaker Playhouse – they all share the same story, but they couldn’t be more different. Little Bulb’s Orpheus is a musical feast. 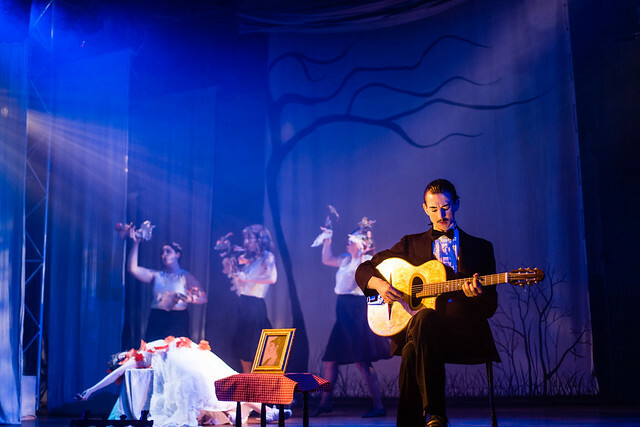 Set in a 1930s Parisian club with guitar virtuoso Django Reinhardt in the title role, it melds together hot club jazz, French chanson, Monteverdi and everything in between with magpie glee. But for Orpheus’ journey out of hell leading Eurydice behind him, Little Bulb created a thrillingly intense original number, ‘La Décision’, an eight-bar riff that builds as Orpheus walks on. It ends with brutal abruptness as Orpheus turns: the music stops suddenly, and Eurydice dies a second death. Little Bulb use the inevitability of Orpheus’ action to build the moment’s dramatic power: as music director Dominic Conway, who plays Orpheus, says, ‘he’s fated to look around – it’s choreography he can’t get out of’. Monteverdi and Gluck both choose a very specific explanation for Orpheus’ action. Monteverdi’s Orpheus begins his walk to the land of light triumphantly, full of pride and joyous anticipation of his coming reunion with Eurydice. But as he walks on he begins to doubt – is it all a trick? The music vividly depicts his rapid vacillation. An unexplained loud noise offstage frightens him into action, and he turns. Gluck explains the moment through an intense characterization of both Orpheus and Eurydice. Eurydice is first overjoyed at seeing her husband, but quickly becomes confused and upset as he refuses to look at her – while he becomes ever more anguished. Passages of recitative alternate with arias and duets as Gluck presents two heart-rending portraits of souls in extreme anguish. Finally, Orpheus turns, and from that moment Eurydice begins to weaken, the painful orchestral accompaniment depicting her feverish breath and failing heart. If The Corridor is one end of the spectrum, then Rossi’s Orpheus is right on the other side: the moment where Orpheus loses Eurydice happens offstage. Rossi’s opera is a theatrical extravaganza – the original performance lasted more than six hours – and, unlike the spare two- or three-person casts used by Birtwistle and Gluck, Orpheus and Eurydice are just two in a huge host of characters. Orpheus’ failure to win Eurydice back to life is reported by the boatman Charon, who interrupts some hellish dances to deliver the news: ‘The villain wouldn’t play it by the book! Just before they left Hades to join the living, he turned around and took a sneaky look!’ The pathos of Orpheus’ loss is delayed to a later moment, as back in the land of the living the distraught Orpheus longs for death. What are your favourite responses to the Orpheus myth? Orphée et Eurydice runs 14 September–3 October 2015. Tickets are still available. The production is staged with generous philanthropic support from Mrs Aline Foriel-Destezet, and is part of #Hofest. Little Bulb Theatre’s Orpheus runs 15–19 September 2015. Tickets are still available. The production forms part of Deloitte Ignite 2015, the annual festival that kickstarts the Royal Opera House Season. Orpheus at the Sam Wanamaker Playhouse runs 23 October–15 November 2015. The Royal Opera’s ticket allocation is sold out, but more tickets are available through Shakespeare’s Globe.